1985　Won a grand prix at the International Competition of Contemporary Ceramic Art in Faenza, Italy. 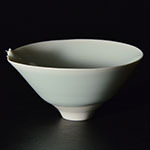 1992　Won an award from The Japan Ceramic Society. 1996　Won a Mainichi Arts Award. 1999　He joined the Ten Contemporary Ceramic Artists of the World exhibition held at the Museo Internazionale delle Ceramiche in Faenza.